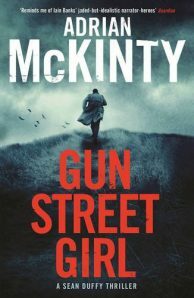 Gun Street Girl is the fourth in the Sean Duffy series by acclaimed crime writer Adrian McKinty. When Duffy grudgingly takes on a double murder case, he finds himself on the trail of a conspiracy which could cost him everything. Belfast, 1985. Gunrunners on the borders, riots in the cities, The Power of Love on the radio. And somehow, in the middle, Detective Inspector Sean Duffy is hanging on, a Catholic policeman in the hostile Royal Ulster Constabulary. Duffy is initially left cold by the murder of a wealthy couple, shot dead while watching TV. And when their troubled son commits suicide, leaving a note that appears to take responsibility for the deaths, it seems the case is closed. But something doesn’t add up, and people keep dying. Soon Duffy is on the trail of a mystery that will pit him against shadowy US intelligence forces, and take him into the white-hot heart of the biggest political scandal of the decade.